You are here: Home / Girls and Entrepreneurship / Don’t spend all of your Christmas/Holiday money!! 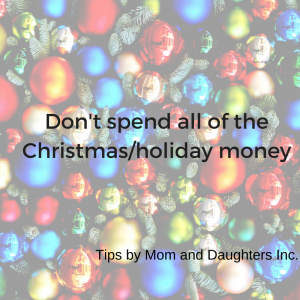 Don’t spend all of your Christmas/Holiday money!! Does your daughter spend her gift money faster than a speeding bullet? I’m betting that your daughter has received money as a gift. Perhaps birthday. Or the holidays. Or some other special occasion. But does she immediately spend her money? Or does she save a percentage? Let’s talk about how she can game change her future by starting a serious savings plan. Start with savings. Make it a habit that every time your daughter receives money, she needs to save a percentage. If they are little, this is easy. You take the money and drop it into a savings account. Or start a 529 account. I started this practice when my daughter was young. While I’m not always perfect, the money does start to add up quickly. It’s the habit. Not the amount. You can also open a savings account and empower them to make the deposits. Make it a fun activity. Let them write out the deposit slip. Count the money that they are going to give to the teller. And yes, yes, yes. I know that interest rates are horrible. But it’s not about earning a zillion dollars every time that they deposit the money. It’s the HABIT of saving that’s important. This habit will last a lifetime if started young. Imagine if you saved a percentage of your money from your first job when you were in high school or college? You’d be sitting on a nice chunk of cash right now. It gives you options. (And kudos if you are in the small minority who did). If you haven’t, please it’s never too late to start! And give it as a powerful lesson to your kids. Don’t get caught up in how much. There are a ton of blogs, financial advisors, etc who will tell you exactly how much to save. But it can get complicated and I don’t want you to worry that you are not saving enough. Just get started. And keep going. Even if it looks like it’s only a few dollars. It will add up over time. Instead, keep it simple. Use the savings jar method. Dave Ramsey talks about it. And I found a great post on how to make your own super easy savings jars on the CreativeSavingsBlog. The important thing is to get started. And make it a habit. Start your kids with 10% if they normally just spend the money. Or challenge them to go higher and see what results happen. So post your pics of your savings jars in the comments below. And good luck getting started! It’s a hotly debated topic. Should you GIVE your daughter an allowance? Let her earn it? Or should you wait until they start earning their own money? I’ll leave the final decision in your hands. 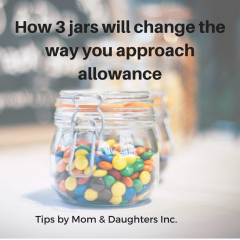 But if you are considering an allowance, let me offer a tool that will help her manage money for life. Heck, it is having a positive effect on how I save since I started this with my daughter. Why should girls learn about entrepreneurship?